We give you the low-down on the latest tools, technology, apps and gadgets to help you talk global business! Absolutely ideal when you are abroad and stuck for words whether it’s for business or for leisure. This latest boggling Google app means that two people, both with the app and speaking different languages, can speak into their phones, and the conversation is translated almost instantly. At the moment translation is only available for English and Spanish. Other languages should be coming soon. 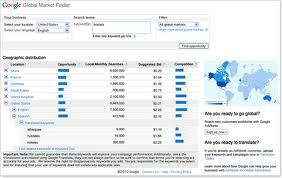 Google have launched a new free tool – ‘Global Market Finder’. The tool helps businesses to find new markets overseas. It does this by translating a company’s keywords into a number of languages, then it ranks the countries with the highest monthly search volumes for the terms. And lastly it provides a ‘suggested bid’ – guidance on how much to bid for the keywords to advertise a product in a chosen market. You can find more information here http://translate.google.com/globalmarketfinder/g/index.html. Just a quick health warning on this though – the keywords are translated using Google Translate (see our article on machine translation) so they are not always appropriate. Do get support from an experienced translator or translation company before confirming the words chosen. You’ll also want to set up a landing page in the appropriate language. If you have a question or would like to know more about us, please get in touch on info@comtectranslations.com or call us on + 44 (0) 1926 335 681.